Yesterday, Nathan woke up at 5:50, as he usually does. As is our routine, I got him a cup of milk, started a “Cat in the Hat” video, and sat down with my coffee for 20 minutes of quiet time before our busy day started. At 6:10, a very sleepy-eyed Matthew came out of his room, and asked to sit on my lap. He said, “so cozy…” as he drifted off to sleep on my shoulder. I loved every minute of it – snuggling with my big 10-year-old bundle of love. For the next half hour, as Matthew slept in my arms, all I could think about was how blessed we are to have this beautiful child in our family. I thought back to when we were so scared – so unsure of what our future and his future would bring. 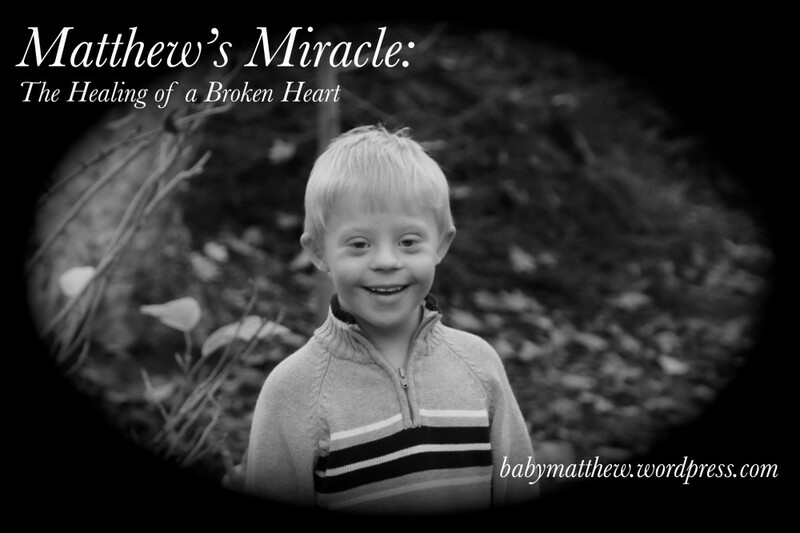 What would it be like to raise a child with Down syndrome? How would it affect our lives and the lives of our other kids? Now, we have a big ol’ bundle of goofy cuddly love, and wonder what we were so scared of. To any new parents wondering what life is going to be like raising a child with an extra chromosome, please know that even though it’s not always easy (but, this is true of any child! ), it is SO very worth it. You will be immeasurably blessed, in ways you can’t even imagine right now. Yes, you will also be challenged, and you will grow. You will learn to slow down a little bit, gain patience and understanding, and you will love and be loved like never before. I love you, too, Mister. More than you’ll ever know. I think God was trying to teach me a lesson in patience and perfectionism by giving me white floors in a house in the country with 5 kids! Also, we didn’t eat in the “dining” area of the house, because it was carpeted! One of our first major projects was to put in luxury vinyl plank flooring (“dirt” brown color!). When we put in the flooring, we lifted the island completely out of the kitchen so we could have the flooring go under the island, knowing we hoped to change the footprint of the island in the future. We also moved the island out toward the living area of the kitchen, giving the kitchen more work space and a more open feel. Then, the kitchen looked like this: The countertops were baby blue, the cabinets were a very worn white paint, and the drawers were so stiff to open that the fronts were coming off from all of the pulling. In October, we began the process of taking out the existing cabinets and countertops, removing the soffit on the ceiling to open up the space, and do some much-needed electrical and plumbing updates. After several months of work, the remodel is finally complete! The last pieces were finished just after my foot surgery in early January. Are you ready for the “after” pictures? I can’t wait to show them to you, because I can hardly believe this is the same house! I absolutely love how it all came together, and I am one very happy mama. Taking out the ceiling soffit and lowering the island to countertop level really opened up the space. My entire ceiling feels higher! Yes, there are TWO dishwashers! It’s amazing how much easier it is to clean up, when there is room for everything to go in the dishwasher – even big stuff! My dad is still finishing up the custom inserts for my baking drawers, and then I will show you the “inside tour” of the storage and functional features that I love. Many thanks to my incredible husband. Several months ago, Micah started writing an essay for a contest hosted by the American Life League’s Culture of Life Studies Program. He doesn’t think that writing is his strong suit (he’d rather do math or science any day! ), but he worked hard on the essay, spending 15-20 minutes or more on it each school day for a couple months. Congratulations! I am pleased and honored to inform you that, after reading over 600 essays in both categories, we have awarded your exceptional essay entitled “My Brother, Matthew” with first place in Category 1 of our 2017 pro-life essay contest! …Micah, thank you for your enthusiasm and passion for protecting the least of these in our society! We are all very proud of your dedication to life and pray that God continues to bless you as you stand for His precious children, giving you courage, strength, and joy as you influence your generation to stand for life! We were all so touched by Micah’s essay. Not only was it very well written, but he really has a great understanding of Christ’s teaching about the least of these. There were so many wonderful essays but his really stood out for many reasons. Thank you for all you and your family do to promote the Gospel of Life! The very first thing Micah wanted to do with his prize money was to buy a gift for Matthew. After that, he plans to give to the Church, buy a lego set for himself, then save the rest for college. We are so very proud of him, his achievements, and the incredible young man he is becoming. My recovery from the tarsal nerve release surgery has continued to go very smoothly. I was happy to trade in the big, bulky splint for a “stylish and festive” cast. 🙂 Believe it or not, the cast, because it is so much lighter and smaller, is more comfortable than the splint. The intense surgical pain only lasted a couple weeks, and then I was able to be up and around. My “hands-free crutch” has let me do a lot. I can walk (like a pirate… arrgh! ), but I can use my hands while I’m off my foot – an incredible help! It also let me navigate tight spaces and toy mine-fields better than I can on my scooter. I have been very grateful for the assistance of this fancy piece of hardware. The cast will come off on Friday, and I will move to a walking boot and be able to start walking a little bit. I will also start physical therapy again, and hopefully be walking all over the place before too long! We had a wonderful Christmas at home with family, and celebrated Nathan’s 4th birthday today. Enjoy the photos! The surgery went well. Thank you very much for all of your prayers- they mean more than you know, and are what I needed most. The surgeon found several varicose veins that were pressing on the tarsal nerve, and was able to remove them along with the scar tissue and release the nerve. This is great news: it means they found something fixable, and fixed it! In a few months, my pain should be greatly diminished, and next year I should be hiking and skiing with the family. The first couple days after surgery, I needed the full dose of pain medication around the clock, which made my head a little foggy and my stomach a little queasy. But, I am doing much better now, and get by with smaller doses of the pain meds. My family has given me lots of time to relax with my foot up, and now I am able to get up and help with a little bit of the kids’ school during the day. I will wear this big splint for a week, then go back to get a cast put on. On to recovery phase! Thanks to the women from our parish, who set up a meal schedule to help feed our family while I recover, and thanks to everyone who has prayed for us or offered to help us during this time. Thanks, especially to my wonderful husband, who is cheerfully taking good care of us all right now. The day after surgery, relaxing in a hotel and enjoying tea in my new “strength” mug from a good friend, who also took care of our kids during the procedure. To make a very long story short, I am once again asking for your prayers. I will be having foot surgery on Thursday, and need prayers for the success of the surgery and a smooth recovery. Just before Christmas last year, I was hurrying in the kitchen, and slammed the inside of my ankle against the door of the open dishwasher. I really slammed it hard – so much so that we thought it could be broken. When x-rays came back negative, we treated it like a bad ankle sprain: lots of ice, elevation, and rest. But, it didn’t get better. So, I was put in a walking boot for 6 weeks. Still, there was no improvement. So, my doctor recommended that I try resting it completely – no weight bearing – for a couple months, to see if that helped. I used a nifty knee scooter to get around the house, crutches when we went anywhere, and relied heavily on help from family and friends to get through our days. However, instead of simple ankle pain, I was now getting symptoms of nerve compression or injury. I had hot/cold sensations, shooting pains throughout my entire foot, tingling, and was losing function. At times, I couldn’t curl or wiggle some of my toes! After bouncing from specialist to specialist and undergoing a myriad of testing, we finally found a foot & ankle orthopedic physician that was able to help me. He diagnosed me with Tarsal Tunnel Syndrome, meaning scar tissue and inflammation from my injury was compressing one of the major nerves that runs along the inside of my ankle, then branches to innervate most of my foot. After all of that, I had a couple months were I was feeling pretty great again. I could do small grocery-store trips, walk out to the swing set with the kids, and stand in the kitchen long enough to prepare a meal. I am in quite a bit of pain every day, and many nights the pain keeps me awake. In many ways, I have learned to live with the pain. If you come in my house, you may not even notice that I lift one foot off the ground while I’m doing dishes, or that I am walking around with an ice pack strapped to my foot. If we’re standing around talking, I may rest my knee on a chair, or suggest we find a place to sit down. But, by the end of every day, I am hurting a lot. At this time, my best chance of feeling better is to have the Tarsal Nerve Release surgery. On Thursday, my surgeon will clear out any scar tissue that is compressing the nerve, and remove a tendon sheath to give the nerve more space. After the surgery, I will be in a cast for a month, with no weight-bearing, then in a walking boot with physical therapy for 4-6 weeks. If all goes well, I will be back to hiking and waterskiing before too long. My surgeon is confident that I will be able to go back to doing all of the things I love to do, and be pain-free after the recovery period (which may take up to a year). However, there is no guarantee that the surgery will be successful. This procedure has a higher failure rate than I would like, so I truly need and appreciate your prayers. Maybe, while I am sitting around with my foot up after surgery, I can catch up on posting some cute kid photos on the blog!